Vinnie the Pooh! : My first commissioned artwork! Claimer: Any resemblance to the photograph is purely unintentional. In case of discrepancies, please attribute it to ‘artistic liberty’. Please give your valuable feedback and remember ‘It’s easy to make cartoons but difficult to make a cartoon character’- a quote by some famous cartoonist. But I have managed to create not only a ‘cartoon character’ but also a cartoon in my first portrait piece. Enjoy! oye.. ye tumhara bhalu achhe songs play nai karta.. selection change karo yaar! Vinsss...wonderful! Artist,Poetess...anything else?i mean hidden talent? btw..first one islooking good than the second one..
Just went through the quotes, just wondering whether the quotes under "Winnie the pooh and Vinnie" are urs?If so y under separate names? 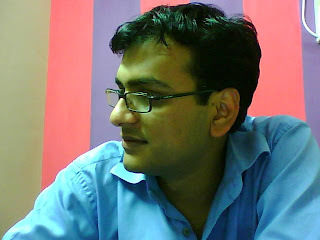 clean shaven kaise banega...tum regularly shave kaha karthe ho??? we shud auction this online! Chriz, thanks ! hope u liked it..who is rkn? hehhehehe...vinnie is me and winnie the pooh is well, disney's popular cute bear - these r his oiginal quotes from some of his adventures in the forest!!! Pretty cool!!! m sure it isn't ur first! vin - POPULAR BLOG!! POPULAR BLOG!! POPULAR BLOG!! happy now ? aur ye bhalu ko main maarne vala hu pakad ke !! ST, thank u thank u thank u...tum jaise 'popular' model ne mere blog ka value bada diya!! bhalu ko maroge tho tumhe shoot kardungi...pehle photo lethe vaqth shave kyon nahi kiya ??? serious work will come soon...am getting serious myself!! Karthik - thanks.. please send me the signing amount ASAP so that I can get my schedule arranged accordingly. ST, chup karo! vaise tumhe cartoon model banane mein mera bada haath hain:) mujhe kuch paise milenge, mere CFO..